The simple test can spot the presence of fentanyl, a powerful opioid drug sometimes added to heroin. Looking to buy Fentanyl test strips at an affordable price? Well, your search ends here as we bring your our most sought after fentanyl urine test strips on sale. The fentanyl urine test strips offer a quick and effortless way to determine fentanyl in human urine. No need to anticipate much as our fentanyl urine test strips provide the outcomes in just as little as five minutes. Fentanyl is a synthetic opioid-associated with the phenylpiperidines and is nearly 100 times more vigorous than morphine. Our fentanyl urine test strips are highly sensitive and can accurately determine even the smallest amounts of fentanyl in human urine. How Do Fentanyl Urine Test Strips Work? This drug dissolves readily in the lipid and immediately traverse the blood-brain barrier. This is reflected in the half-life for equilibration between plasma and cerebrospinal fluid of about 5 minutes for fentanyl. The Fentanyl rapid test strip (pee) detects fentanyl effortlessly through visual interpretation of color development on the strip. The test area of the membranes traps the drug conjugates. Throughout testing, the specimen reacts with antibodies conjugated to colored particles and percolated on the sample pad. After removing the test from a sealed pouch or the strip from the canister, use it immediately. We advise you to use it within one hour. Do not forget to close the canister tightly after removing the strips. 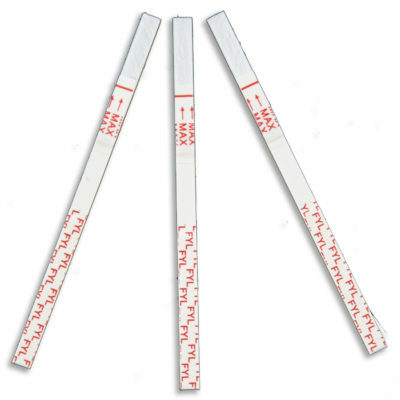 Hold the fentanyl urine test strips by the end and avoid touching the strip membrane to circumvent any contamination. Hold the strip vertically and lower it in the urine specimen for about 10-15 seconds. Do not exceed the MAX line on the test strip. After the specified time duration, remove the strip and place it on a impermeable flat surface. Start the timer immediately and wait for the colored bands to become visible. Read the result at 5 minutes. Do not exceed the timeline by 10 minutes to assess the results.